Be the first to share your favorite memory, photo or story of Ezra. This memorial page is dedicated for family, friends and future generations to celebrate the life of their loved one. 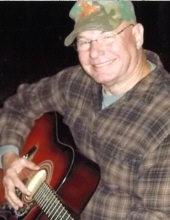 Ezra Harold “Buster” Wilson, age 74 of Bowdon, Georgia passed away April 06, 2019. He was born August 12, 1944 in West Point, Alabama, son of the late Harvey Lee Wilson and Dimont Sheets Bennett. He proudly served in the United States Army for 20 years and then later spent another 20 years working with his brother at Acro Signs creating signs and billboard construction. Buster had several loves in his life including farming and family game nights of Domino’s or long poker weekends. Most of all he loved his grandchildren. In addition to his parents, he is preceded in death by his wife, Jeannette Gilmer Wilson; step-son, Bobby Charles Franklin; sister, Patricia “Cricket” Rushing; and brother, T.L. “Rat” Wilson. He is survived by his children, Peggy Wilson-Terrell (Matthew S. Terrell) and Rodney H. Wilson; sister, Glenda Adams; brother, Jessie Ray Wilson; grandchildren, Jacob Franklin, Holly Franklin, Jessica Wilson, Casey Wilson, Lauren Lacoste, Sydney Lacoste, Jay and Heather Lacoste, Mathew Githens, and Mitchell Githens; and three great grandchildren, Peyton Franklin, Aubrey Franklin, and Hudson Franklin. Funeral service will be Thursday, April 11, 2019 at 2:00 PM from Martin & Hightower Heritage Chapel with Rev. Lynn Janney officiating. Interment will follow in High Point Cemetery. The following gentlemen will serve as pallbearers: Alan Fulghum, Ronny Nixon, Jay Lacoste, David Mack, Kyle Fulghum, and Andy Hammock. The Army Honor Guard will perform military honors. The family will receive friends at the funeral home on Wednesday, April 10, 2019 from 5:00 PM until 7:00 PM. Messages of condolences can be sent to the family at www.martin-hightower.com . To send flowers or a remembrance gift to the family of Ezra Harold Wilson, please visit our Tribute Store. "Email Address" would like to share the life celebration of Ezra Harold Wilson. Click on the "link" to go to share a favorite memory or leave a condolence message for the family.